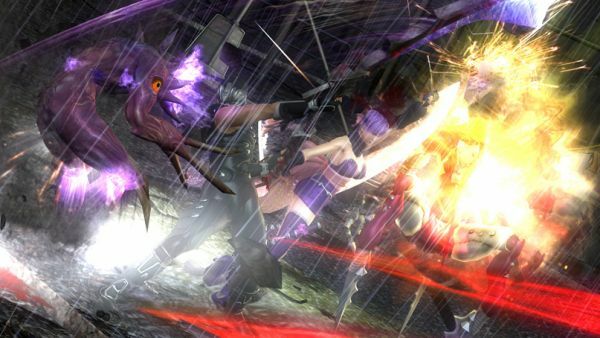 Ninja Gaiden 2: Sigma caught our attention when a co-op mode was revealed a few months ago, and we've been interested in the development up to this point. Team Ninja has put together a nice interview explaining how Ryu Hiyabusa will work with others in a co-op mode, and how Ninja Gaiden 2: Sigma is the definitive Ninja Gaiden, not just a sequel or port. Ninja Gaiden 2: Sigma is the PS3 version of Ninja Gaiden 2, with a few specific differences. Aside from adding new weapons, and improving the offline content, the biggest change has been additional playable characters. Online co-op, complete with female allies will give Sigma 2 something Ninja Gaiden fans have never seen before. "Sigma 2 will feature new playable female characters, which should be familiar to fans of the series and of Tecmo's Dead or Alive. The first is Ayane, the purple-haired ninja from DOA, who will come packing her own unique moves, weapons, magical attacks, and provocatively placed butterfly accessory. The second new character is Momiji, last seen at a lower resolution in Ninja Gaiden Dragon Sword on the DS, who will bring her own arsenal of abilities and weapons to the fray. Both characters will be integrated into the story, which will branch off to follow their adventures. Not to be outdone in the new content department, Hayabusa will face off against new enemies and bosses with some new weapons tossed in to help deal with the new foes." While the co-op is a stand-alone mode, we hope this is the direction Team Ninja is headed with future releases of this title and other franchises! Check out the gamespot interview for additional details. Page created in 0.5540 seconds.